Dogs are not known for their hygiene, but without a doubt their health can be affected if we do not clean stainless steel dog bowls or toys regularly. In stainless steel dog bowls, the mixture of food and dog saliva can cause a gross film to stick to the bowls’ surfaces. Yuck. This leftover gunk can become rotten and rancid, and taint new food you put in the bowl. Stainless steel bowls make the best dog dishes. They can easily be thrown in the dishwasher to properly clean and sanitize them. If you don’t have or want to use a dishwasher, you can soak the stainless steel dog bowls in warm water and dish soap. Use a scrub brush or scrubbing sponge. Avoid using a harsh scrubber like an SOS pad because it will scratch the stainless steel. Doggo spit and food will stick even harder to a scratched up surface. 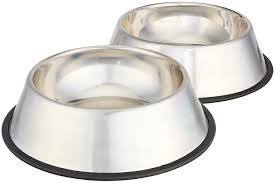 If you feed your dogs wet food, you may find soaking the stainless steel bowls is helpful. Soaking in warm water and dishsoap or a little vinegar can loosen the build-up in the bowls before scrubbing. Always rinse bowls well with water after cleaning. A good rule of thumb is to clean stainless steel dog bowls minimum once a week. Depending on the type of food you give your dog and how slobbery your dog is, you might have to clean stainless steel dog bowls every day or every other day.